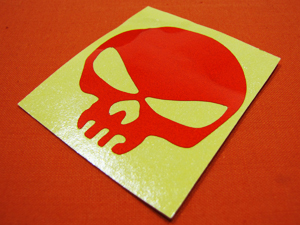 We can create stickers for you! One colour, any volume and cut from vinyl, so there will be no white background! One-offs welcome. They look great on the back of laptops and keyboards or on guitars and equipment cases. Just peel and stick! Specially computer cut so there's no white background. Indoors or�outdoors in the sun, rain and snow, it'll last 5 years! Just peel and stick! Specially cut from reflective vinyl so there's no background.